Congratulations to the Class of 2017! SHS wishes you all the best with your post graduate plans. Please visit our YouTube channel for the latest videos from our graduation ceremony. If you have not had a moment to check out the senior video, here is the link. Thank you Mr. Lenore for another great year of videos! Information for summer reading and AP/EEP summer packets may be found here. If you child requires summer school, please click here for more information. SHS Counselor Janet McGinnis accepted her award this week from the Rhode Island Association of Admission Officers. Mrs. McGinnis is the Distinguished School Counselor of the Year! The SHS staff ended the year on a positive note with a cookout on the last day. This has become an annual tradition with the staff. 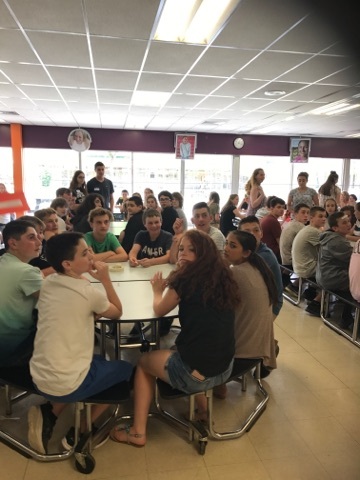 The SHS Freshmen Mentors hosted the Class of 2021 for an ice cream social this week. The current 8th graders heard from current sophomores and juniors about the high school. They also had an opportunity to sign up for fall sports. Community Service Opportunity – Duffelbag Bash for kids is a DCYF project running this summer. The purpose of this event was to provide all youth their own personal suitcases/duffelbags when moving from a placement, whether it be to another group home, to a foster home, etc… This was our way to ensure no kid has to transport their belongings in garbage bags, the way they most often are moving their possessions. Last year was a huge success and we gathered over 500 duffelbags, and hundreds of gift cards to be matched with each duffelbag for the child to purchase any necessities or items they may want. We are hosting the same event this summer on August 13 at the Matunuck Community Center. If you are interested in helping out please contact Mr. Kelley or Mr. Hopkins. According to the Rhode Island Department of Health , School Health Regulations, all students entering the 12 grade ware required to have a booster dose of Meningococcal vaccine on or after their 16th birthday and a copy of a physical exam after their 16th birthday. Please send in this documentation as soon as possible, prior to the start of the 2017-2018 school year. I hope everyone has a safe and relaxing summer break! Do your summer reading!